Dubai-based global marine terminal operator DP World has acquired Danish logistics company Unifeeder for $762.8 million from Nordic Capital Fund VIII and certain minority shareholders. 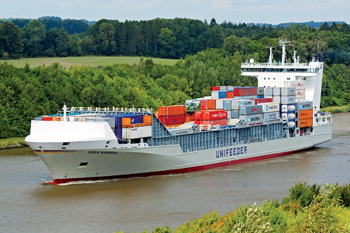 Founded in 1977, Unifeeder operates the largest container feeder in Europe. It provides transport solutions for international container shipping lines between international and regional ports, and shortsea services to cargo owners with fully multimodal door-to-door solutions, combining seaborne transportation with road and rail. Unifeeder reported a revenue of €510 million ($589.2 million) in 2017, and EBIT margins in line with other asset-light logistics operators. The acquisition is subject to regulatory approvals and expected to be earnings accretive in the first full year after completion. It will be financed from existing balance sheet resources and is expected to close in 4Q 2018. The acquisition of Unifeeder will further enhance DP World’s presence in the global supply chain and broaden our product offering to our customers – the shipping lines and cargo owners – with a view to ultimately reduce inefficiencies and improve the competitiveness of global trade, the company said in a statement. The current operations of Unifeeder are complementary to DP World’s existing business and provides future growth opportunities, it added. Based in Aarhus (Denmark), Unifeeder operates the largest and most densely connected common user container feeder and an important and growing shortsea network in Europe, serving both deep-sea container hubs and the intra-Europe container freight market. “We are delighted to add the Unifeeder brand under the DP World umbrella, which supports our strategy to grow in complementary sectors, strengthen our product offering and play a wider role in the global supply chain as a trade enabler,” said DP World’s group chairman and CEO, Sultan Ahmed Bin Sulayem. “The ever-growing deployment of ultra-large container vessels has made high-quality connectivity from hub terminals crucial for our customers and Unifeeder is a best-in-class logistics provider in this space with a strong reputation in Europe,” he added. “We are excited to join the DP World Group as we believe that we will benefit from the group’s significant expertise in the wider supply chain and excellent relationships with shipping lines and end cargo owners,” said Unifeeder’s CEO Jesper Kristensen. “Not only is there commonality with our business models but we also share the vision of serving our customers through removing inefficiencies and delivering sustainable shareholder value,” he said. “We have enjoyed great success over the last five years under Nordic Capital’s ownership, and we believe that our brand within the DP World Group has the opportunity to accelerate growth, expand further and take the business to the next level,” he concluded. Meanwhile, Moody’s Investors Service has upgraded the long-term issuer rating of DP World Limited (DPW) to Baa1 from Baa2. The outlook on all ratings is stable. “DP World’s growing scale and geographic footprint has increased its business resilience which Moody’s now sees as more appropriately reflected in the Baa1 rating,” he added. The rating action on DP World reflects its diversified global operations; the positive expected long-term growth in international container traffic; its solid profitability and liquidity profile; its expected adherence to leverage targets as proven by management’s track record; and its flexibility to delay capex to support the balance sheet if needed, said a statement from Moody. 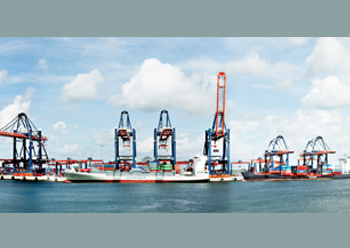 The company tends to focus on origin and destination ports, which are relatively less sensitive to cyclical downturns as opposed to transshipment ports. Financial metrics are healthy, with Moody’s adjusted EBITDA margin of 58.6 per cent, adjusted funds from operations (FFO) interest coverage of 5.3x and adjusted FFO/debt of 19 per cent as of 2017YE, it said. Moody’s also recognises that the company’s diversified operations shows that while parts of its port portfolio may face more challenging operating conditions in the near future, other parts of the portfolio may be net beneficiaries of any changes to global trade flows. Total sources will be more than sufficient to cover forecasted outflows over the next 12 months of up to $1.4 billion capital expenditures; around $350 - $380 million of dividend payments; $302 million of debt maturing in 2018; and M&A activity such as the acquisition of Drydocks World and Dubai Maritime City closed in January 2018. Over the past five years, DPW has been broadly free cash flow neutral excluding M&A activity and Moody’s anticipates that this trend will continue.